Are you looking for furniture or cabinet finishes! Environment friendly PolyAcrylic finishes are easy to apply, durable, and simple to repair. Our special waterborne formulas deliver extraordinary depth and vibrancy of color that cannot be achieved in any oil based product. If you are looking for color - use General Finishes Water Based products! 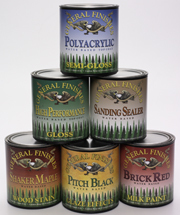 Whether you want bold and luscious or traditional and classic, General Finishes has the finish for you. Available by the pint, quart or gallon. For a local dealer near you, visit General Finishes retail store locator for fine wood finishes. Award winning finishes! General Finishes High Performance was rated Author's Best Overall Choice. See article by Fine Woodworking Magazine, Nov/Dec 2006. Milk Paints are the star of the furniture fashion market. They are interior/exterior acrylic paints suitable for indoor or outdoor furniture, crafts, and cabinets and can be applied directly from the can to produce a high quality satin sheen finish. When used with Glaze Effects, you can create all the new decorative finishes such as distressing, antiquing, marble effects, rag rolling, or color washing. High use flat surfaces such as dining tables and desks will develop the patina of every day life over time so we recommend clear or wood stain finishes to our customers who are patina-adverse. Milk Paints can be used alone or mixed with any other product in the General Finishes Water Based line, including Wood Stains, Country Colors, and Topcoats. Milk Paints are available in the following colors: Snow White, Antique White, Linen, Millstone, Outback Brown, Little Pink, Buttermilk Yellow, Somerset Gold, Sage Green, Bayberry Green, Basil, Cypress Green, Red Pepper, Autumn Haze, Brick Red, Tuscan Red, Baby Blue, Federal Blue, Coastal Blue and Lamp Black. The digitized colors shown are for reference purposes only. Always test stain on a hidden area of the wood to verify desired color. Glaze Effects are translucent water based colors used to create beautiful faux and decorative finishes. Suitable for decorative finishes such as distressing, marble, shabby chic, burnishing, color washing, rag rolling and wood graining. Use over Wood Stains, Country Colors, Antique Wax and Milk Paints. Glaze Effects can be inter-mixed to create custom colors. They may also be layered over one another to create deeper, richer looks. Glaze Effects are available in the following colors: Winter White, Yellow Ochre, Red Sienna, Burnt Umber, Van Dyke Brown, Pitch Black and Clear Base (not shown). All finishes are shown here over Buttermilk Yellow Country Milk Paint. The digitized colors shown are for reference purposes only. Always test stain on a hidden area of the wood to verify desired color. Samples of Glaze Effects or Water Based Wood Stains over Milk Paints - click here for more samples. Our Water Based Stains have all the advantages of oil base stains: they spread easily, can be repaired, can be blended effortlessly, and have plenty of open time. The thicker formula allows controlled penetration, which will reduce blotching on hard-to-stain woods such as Aspen, Pine and Maple. Water based Wood Stains are available in the following colors: Whitewash, Natural (clear finish), Country Pine, Golden Oak, Antique Oak, Pecan, Shaker Maple, Early American, Antique Cherry, Black Cherry, Rosewood, Cranberry Red, Walnut, Brown Mahogany, Espresso and Black. The digitized colors shown are for reference purposes only. Always test stain on a hidden area of the wood to verify desired color. This crystal clear finish is rated by Fine Woodworking magazine as "Best Brush-on" in a competition of national brands. It is our standard "work horse" top coat and can be used in furniture and woodwork. Formulated to be durable and consumer friendly, it flows and levels easily and has great adhesion characteristics. It has strong sag resistance for vertical surfaces and its higher polyurethane content provides greater durability than other polyurethane/acrylic blends. Once you use PolyAcrylic Blend you will say to yourself, "Fine Woodworking was right on!" Available in the following sheens: Satin, Semi-Gloss, and Gloss. Winner of Fine Woodworking's Best Overall Choice Award, High Performance Top Coat is the hardest, most durable consumer polyurethane top coat on the market today. It contains all the consumer friendly characteristics of PolyAcrylic Blend. In addition it contains a UV Stabilizer to protect it from breaking down in sunlight and to protect the underlying stains from fading. And with its pure polyurethane durability, it can even be used on floors. This is the most durable product. Available in the following sheens: Satin and Gloss. Sanding Sealer is a water base acrylic basecoat. It provides initial sealing for all GF water base topcoats. It can be used over raw wood or a stained surface. Sanding Sealer has been sterated so it will sand easier. Sanding Sealer is not as durable as the topcoats so it is not recommended for a final finish. Drying Time: 1-2 hours under normal conditions.